The North Carolina Sweet Potato Commission Inc. is a nonprofit corporation made up of over 400 sweet potato growers along with the packers, processors and business associates that support them. The sole purpose of the commission is to increase sweet potato consumption through education, promotional activities, research and honorable horticultural practices among its producers. Thanks to the six sweet potato farmers that chartered the commission in 1961, the commission has supported its growers and maintained North Carolina as the No. 1 sweet potato producing state in the United States since 1971. Enriched with vitamins A-C, fiber, antioxidants and macronutrients, North Carolina sweetpotatoes are a healthy option for any diet. 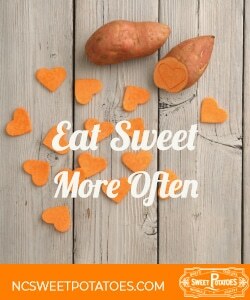 Visit ncsweetpotatoes.com to find a recipe even your most finicky eater will love.